I am trying to make meal planning and shopping easier for myself. I shop every 2 weeks and usually I have to take all 5 kids with me. If you are a Momma, you know that can be a chore in itself! For the most part, they are great helpers. Learning about finding the best deal, learning how to pick out great produce and meat. I think this is important life skill to learn. They also love to help prepare meals, so it is great for them to see the whole process of what I do to prepare meals for our family. Starting with the meal plan, I am planning on trying a few days for the Countdown to Competition (C2C) meal plan. (It is a pretty restrictive meal plan that comes with the 21 Day Fix Extreme program.) I am in the 1,800-2,099 calorie bracket. The pink days are the days I will be doing the C2C plan. 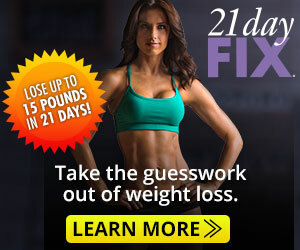 On the blue days, I am following the 21 Day Fix Extreme meal plan. Are you ready to learn more about the 21 day fix or to join my accountability group? Join Here! This journey to being healthier is hard, especially if you are doing it alone! I just started a new Recipe/Support group on Facebook. It is open to anyone and it’s FREE! Click HERE to join! Be sure to READ the PINNED post at the top of the group! If you are like me, you LOVE yummy Salads! I think they are great to throw together and know that I am getting a healthy meal in for my family with lots of veggies & flavor! Salads do not have to be the boring iceberg lettuce with ranch dressing. Nothing wrong with that, if that’s what you like, but there isn’t much nutrition in it either. Try to experiment with different vegetables for you salad. Add some fruit, nuts, cheese…mix it up! I also like to make my own dressings. Not only does it save money, but I know what is in it! Have you ever looked at the ingredient list on a bottle of salad dressing? I would rather spend and extra 5 minutes to make it myself and know what we are putting into our bodies! This salad was definitely a HIT with my family! I will be making it again! It does make a HUGE bowl, so you may want to make 1/2 of the recipe. (We are a family of 7.) I will say I am loving the leftovers for my lunch the past 2 days. The cabbage base is still crunchy like the first day! **If you refrigerate the sauce it will thicken a bit, you may want to add a tiny bit of water to thin before using. Toss all the ingredients for the salad in a large bowl and mix well. Grill your steak or chicken breast, then slice. For the sauce, toss all the ingredients into a blender and blend until smooth. I like to keep salad, meat, sauce and peanuts all separate until I am ready to eat. Put the salad on your plate or in a bowl, top with meat, peanuts and sauce. Once I have my salad put together, I like to stir to make sure the sauce is on every piece! My husband and son TJ will be shaving their heads to raise money for childhood cancer research! Did you know that kids’ cancers are different from adult cancers? It’s true. And childhood cancer research is extremely underfunded. So they decided to do something about it by raising money for cures. If your family is like mine, they LOVE granola bars! However, I am not a fan of the price or some of the ingredients in the ones you find at the store. Since I make my own granola, I figured I would attempt to make the family some granola bars. This was my first attempt and I would say it was pretty successful. I think next time I won’t boil the honey as long, maybe they will turn out to be more of a “chewy” granola bar then. These have some crunch to them. They are perfect for the big kids, but the little ones have a struggle eating them. For variety try adding different nuts, seeds, raisins, cranberries…let me know what you tried! Cook the Granola according the directions. Once the granola is done, heat the honey and water in a medium saucepan over medium heat. I used a candy thermometer to heat to 270 degrees. (Next time I will try a lower temp. to see if I can create a “chewy” bar.) Once you reach 270 degrees turn off the heat and stir in peanut butter, if using. Pour the honey mixture over the granola and stir. It will seem a bit dry, but make sure it all gets covered well. Line a 9X13 pan with parchment paper. Pour the granola mixture into the pan. Use the back of the spoon to press into the pan. I sprinkled chocolate chips onto after I pressed them into the pan. Use another piece of parchment paper on top of the bars to press the bars as compact as you can. (The parchment paper is to help since they are so hot. And making sure they are compact will help them to stick together once they cool.) After they have cooled for about 45 minutes, lift the parchment paper out of the pan and cut the bars. You want to cut them while they are still a little warm or else they will crumble when you try to cut them. Once you have cut the bars, let them cool completely. Store in an airtight container. Traditionally this type of soup is made with cream and sausage, but since I am trying to be healthier not only for myself but for the whole family, I decided to try to revamp one of our favorite soups! I have to say I honestly don’t notice the difference in taste! My twin daughters actually had 3 bowls tonight! I am glad it makes a large pot of soup, so I can have some for lunch tomorrow! Chop the kale (I used a 1/2 of a 1 lb bag that was already chopped). In a skillet over medium to high heat add the sausage and fennel seeds, cook until browned. Crumble and drain any grease. Add the onions and garlic to the sausage and cook until soft. Place water, broth, potatoes and sausage mixture in a large pot. Bring to a boil and cook until potatoes are soft. Add the milk and kale. Season with salt and pepper. *You can make this is a Crock Pot as well. When you get to the step to add the water, broth, potatoes, and sausage mixture to a large pot place in a crock pot instead and cook on low for 7-8 hours. In the last 30 minutes of cooking add the milk and kale. Valentine’s Day is just around the corner and we all know that means lots of CHOCOLATE! It is no fun to say that you can not enjoy this special LOVE holiday because you are now a Fixer! I was going to make the kids a snack yesterday and had this great idea to make myself a CHOCOLATE BAR! I used my 2 orange containers from the 21 day fix to make my bars. For the kids I used some fun candy molds that I have! Happy Valentine’s Day! Melt the peanut butter, coconut oil, and honey together. Stir in the cocoa powder until smooth. Pour into molds. Place molds in the refrigerator or freezer to harden. Store in the refrigerator. 21 day fix: whole batch= 4 tsp and 2 tsp sweetener. Half batch 2 tsp and 1 tsp sweetener.